Racial 'Bleach Bombing' at UT? 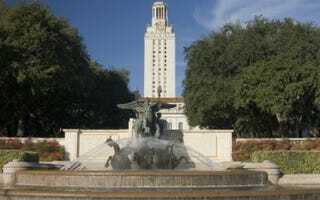 The University of Texas at Austin will make race-related news Oct. 10 when the Supreme Court hears arguments about the constitutionality of its affirmative action policy. But this week, reports of possible hate crimes on campus have put the school's students of color in the spotlight in a way that's alarming regardless of one's views about the value of a diverse campus and whether race should be considered in admissions. Tuesday evening, UT students marched in protest of what they say are racially motivated "bleach bomb" attacks, in which balloons full of bleach are hurled at black, Latino and Asian members of the college community. "A bleach bomb fell and hit me, my roommate; well, almost hit us. It barely missed us," student Jaysen Runnels told KVUE News. "It's very frustrating to know that it's 2012 and that stuff like this still happens." "It is people of color they are attacking in West Campus," Taylor Carr, a sophomore anthropology student, said at this week's demonstration. "Until we put pressure on the university to [protect] us, these events are going to keep happening." Other students said the attacks were race-neutral pranks: "I have seen it happening for the past three years, all the time," student Sophie Weiner said. Police told KVUE that they're investigating several incidents and that it will be up to prosecutors to determine whether they are hate crimes — a designation that is difficult to prove because "motivation can be very subjective," according to Officer Steve McCormick said. Those in the group protesting the attacks would disagree that it's hard to determine what inspired the attacks. Chas Moore, a former UT student and community activist who has played a lead role in organizing current students' response, told the UT Horn that on at least one occasion, the bleach bombs had been followed with racial epithets shouted from above. "This is not 1960," Moore said. "We are not going to be afraid to walk anywhere. We are not going back in time." Read more at the Horn and KVUE News.